When you run a media blog like this one, you're email in-box tends to fill up with press releases. If your site's as specific as mine, the vast majority of them are largely irrelevant and just amount to spam. But the upside to that is that once in a while you wake up to some truly great and unexpected news in your in-box... like yesterday morning. Yesterday, Acorn Media, ITV and Eleventh Hour Films announced that one of my very favorite TV series of the last decade, Foyle's War, would have another season. And, of particular note to readers of this site, while past seasons have always contained a definite element of espionage, the new season will transition into a full-on spy show! The original incarnation of Foyle's War focused on the exploits of a Hastings police inspector in wartime England. 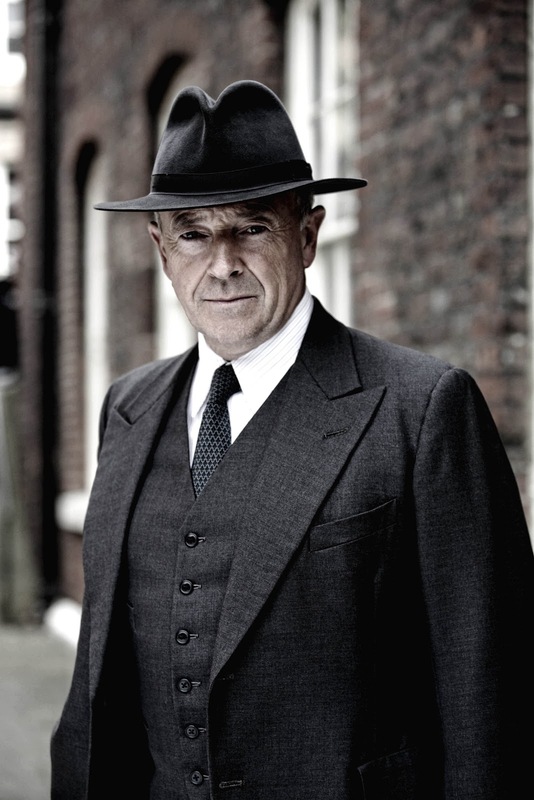 The great Michael Kitchen (Bill Tanner to Pierce Brosnan's James Bond) played the sublimely understated Detective Chief Superintendent Christopher Foyle, whose unwavering integrity often put him at odds with his superiors, the military and the intelligence establishment. Unsurprisingly in a time of war and a country under siege, many of his cases involved enemy spies or saboteurs, and he frequently came into contact with members of various British wartime spy agencies. Now that the war is over and Foyle is retired as a police officer, it seems like those contacts will play a big role in the next stage of his career. According to the press release, "Series 8 will be set during the early period after World War II with Foyle focusing his attention on the world of espionage as he gathers secret intelligence in support of Britain’s security, defence and the Government’s foreign and economic policies. The stories will range from Foyle identifying highly placed atomic spies to a true story of government corruption. A world of transition where the values and certainties of the war have given way to austerity, exhaustion and doubts about the direction the new government is taking. In his new role as a Senior Intelligence Officer, Foyle discovers that the British establishment is rife with communist sympathizers and traitors. In this delicately balanced period in history, 1946-47, Foyle will use all his intelligence, guile and intuition to keep the country safe." In addition to Michael Kitchen, original series co-star Honeysuckle Weeks is slated to return to the drama playing as Samantha Stewart, Foyle's one-time driver. According to the press release, “Post-war, Samantha is now married and relishing domesticity. Her character also enters a fresh era as she delights in a surprising new working role.” Not mentioned is the third series star, Anthony Howell, who portrayed Foyle's second-in-command in Hastings, Sgt. Paul Milner. Milner had moved on in a logical career direction that made it difficult to shoehorn him into the last season's plots, so it seems unlikely that he'll be back for these new episodes... though it would be nice if Horowitz can at least work in a cameo for him! The new season is slated to go into production this fall to air in 2013. While all previous editions of Foyle's War have been seen in America on PBS, the U.S. broadcaster for the new episodes has yet to be announced. There was a bit of an outcry here in the UK when ITV announced the cancellation of this series. It was believed to have mainly been down to a previous Controller of Programmes at ITV. Now Peter Fincham has the role of Controller, it's widely believed he is the driving force behind the return of the series. This. Is. AWESOME. Kind of annoyed Anthony never mentioned anything about it last time we spoke ;) but hey, I'll take good news any day! No mention of the return of Julian Ovenden, whose scenes with Michael Kitchen were some of the best. He is a very natural actor and could surely be a real asset to the production - particularly with his background in the series. However, I will say this: anyone interested in film or especially acting should study the previous series and how Mr Kitchen does what he does. I am a Yank but I don't understand why American TV can't even come close to matching British shows. The British understand good writing and acting will always outclass action and explosions. Bourne Legacy Trailer and Poster Unveiled! Network DVD Sale: Last Day!